Have food allergies or restrictions? Here’s an easy to make gluten-free and dairy-free cake recipe. All you need is a box of gluten-free cake mix and store-bought dairy-free frosting. So simple and it tastes great too! I covered Part 2 of the Entertainment Technology Badge for Junior Girl Scouts at our troop meeting. At a previous meeting, we learned about badge requirements 2 (video game development), 3 (amusement park science), and 4 (special effects). For Part 2, we investigated badge requirements 1 (animation) and 5 (sound) for the Entertainment Technology badge. The Maker Faire Bay Area is this weekend, May 19-21, 2017, at the San Mateo Event Center. MakeHardware had a booth at the Maker Faire last year, but we have been too busy to run a booth for 2017. We do plan to attend for a day to check out what other folks have been busy making! If you decide to check out the Maker Faire this weekend, make sure you plan for enough time to get there and back. The Maker Faire is huge and even sets up exhibits in the parking lots at the San Mateo Event Center, so parking onsite is not available. There are shuttle buses and public transit, but be ready for a wait during busy times. The Maker Faire is totally worth the trouble, just be prepared! Here are a couple of pics from our booth last year. 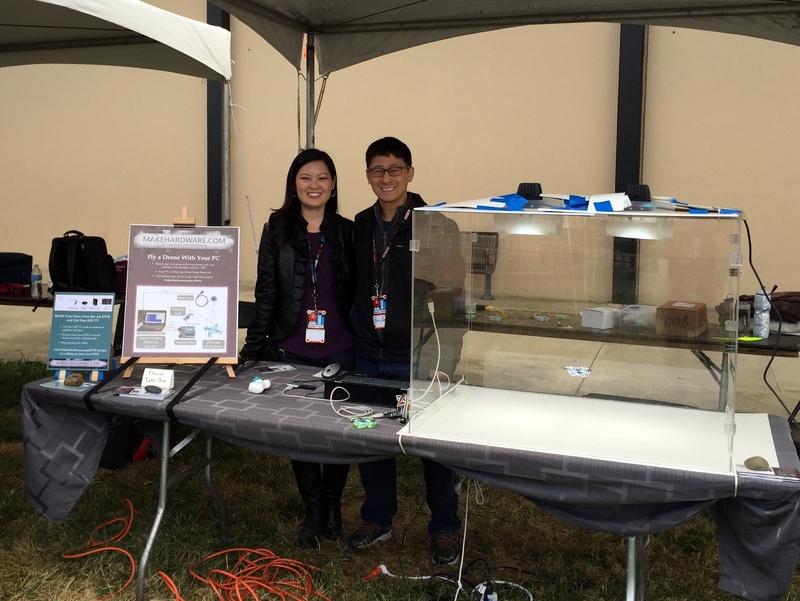 The MakeHardware booth at Maker Faire Bay Area 2016. Do you see our little drone flying inside the enclosure? 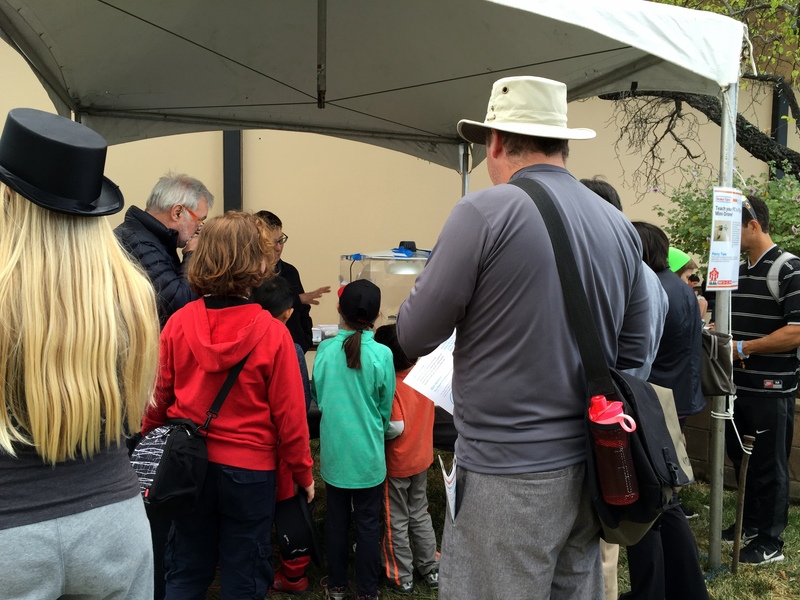 Our booth was in the back corner, but we still had plenty of people come check out our PC-drone flying project! My favorite areas of the Maker Faire include the cooking (last year I bought some great fermentation tools), the crafts and the kid sections. There are lots of electronics, light sculptures, drones, huge metal sculptures, fire art, and tons of crazy creativity! I manage a team of electrical engineers, and at the end of every year I like to run a team building event. Last year I bought everyone a mini-drone, and we had a lot of fun flying them around a conference room. This year, I bought a bunch of remote control insect toys and the activity was to assemble them and then have teams compete in races and other games. These are the robotic insect competitors. From left to right – a Kamigami Goki robot, the Hexbug Battle Spider, and a Hexbug Fire Ant. I have a team of nine people, so we divided into 3 teams of 3. Each team received one Kamigami robot, one Battle Spider, and one Fire Ant. The first activity was to assemble the robots. These Robots are available in 4 models and can be controlled via Bluetooth from iOS and Android devices. These robots have light and IR sensors, and IR transmitters. The apps for these robots are written very well and allow you to play various games such as “freeze tag” and make up your own games as well. The little guys move slowly, but they are quite fun to drive around. The turret on the top rotates and allows you to “shoot” IR beams at other spiders so you can play a laser tag game. These little guys are simple and fun to drive. They move very fast, but are a bit difficult to control, especially on carpets. The Kamigami is manufactured out of a flat flexible plastic laminate which you have to fold like origami to create the robot’s legs and body. Assembling it took each team about 45 minutes. I wouldn’t say it was “simple” (there is no chance my parents would ever do it), but the online directions were good, and the pieces were precisely cut and fit together very well. For most engineers this will be fun. The other robots didn’t require any assembly. The one tricky thing is that if you want to run multiple Battle Spiders, you have to make sure that each one is synchronized to a different remote controller channel. There are four possible channels, so you can run up to four spiders at a time. For the Fire Ant, there were only two possible channels, so you can only run two Fire Ants at a time. For our competitions we setup a simple U-shaped race course and put some small cardboard boxes as obstacles. None of the robots can really climb over any significant obstacles, but just steering them around obstacles or through a narrows space is challenging enough. Probably the most fun event we had was a Sumo competition where we put all of the robots on a table and then had them try to push each other off, with the winner being the robot that stayed on the longest. A large number of contestants ran off the edge of the table on their own. The Battle Spiders had a significant edge in this event because they were heavier, grip the table better, and since they move slower they were also less likely to be driven off by mistake. At the end of the event, everyone got to take home one of the robots. The winning teams got to choose which robots to take first. A good time was had by all. Or, at least that’s what they said to me, but I’m the manager, so who knows what they really thought. I enjoyed the Kamigami Robots so much, so I bought two for myself my daughters. They’re definitely more fun to play with when you have two. Author mhadminPosted on January 24, 2017 January 26, 2017 Categories ElectronicsLeave a comment on Teambuilding with robotic insects! At MakeHardware.com, we love hosting elaborate birthday parties for our kids! I was all for having my daughter’s ninth birthday party at our local paint-your-own-pottery studio, but then my daughter suggested a Little House on the Prairie theme and I couldn’t resist! It’s the perfect birthday party theme for makers! According to tech blogger Dave Zatz, the next Tivo OTA DVR might have an architecture that is a lot more similar to the Tablo series of OTA DVRs. What this means is that the Tivo DVR named “Mantis” would no longer connect directly to the TV, instead it would “transcode” video to a streaming device such as a Roku, Apple TV, or Amazon Fire, or a table or phone. The benefit of this approach is that one box can stream to multiple TVs or devices and it can be significantly cheaper in a household with multiple TVs. Previously, multiple TV households wanting to have DVR features would need a Tivo mini for each TV. This type of device definitely seems like it might appeal to the growing number of households that already have a full array of streaming devices everywhere. As others have noted, streaming services are not perfect – they can be laggy, and are particularly prone to crashing during major live sporting events. Purchasing something like the Mantis would give them benefit of having lag-free OTA broadcasts and commercial skipping capability throughout their house. Hopefully the acquisition of Tivo by Rovi doesn’t delay or interfere with this product launch! Streaming services still cost money, and as this NYTimes article pointed out, there are some drawbacks. Broadcast TV signals can provide high quality HD images and in many ways still provide a better user experience that is easier to use and has less lag. Interestingly, the number of households that were Internet streaming also grew from 4% to 6%. In terms of percentage, it is definitely much faster growth, but it’s interesting to consider that the number of OTA only households is almost three times as large. For what it’s worth, my household has been OTA-only since 2012, and I’m a big fan of having an OTA DVR and of not paying any subscription fees. After reading my post about how I used my computer to fly a Cheerson CX-10 drone, several people have asked me if it is possible to control other drones in a similar way. It is in fact pretty straightforward, and in some cases you can re-use exactly the same hardware that I used to control the Cheerson CX-10 – the Arduino UNO and the Addicore nRF24L01+ Wireless Kit . It’s hard not to wonder if Microsoft’s DVR strategy has been influenced by the growth of Sony’s PS Vue service and it’s “Cloud DVR.” From a revenue perspective, the attractiveness of the monthly subscription model for streaming must have turned some heads at Microsoft. I’m guessing that Microsoft will be attempting to come out with a streaming service and Cloud DVR to compete head on with the PS Vue rather than a DVR than runs locally. This announcement doesn’t change the fact that you can still use your Xbox to watch OTA TV if you just buy an antenna and tuner, but you won’t be able to record it.